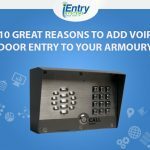 A solution iEntry Systems offer, is an Axis SiP intercom bundle: An outdoor Axis HD IP dome camera and the very popular, outdoor SIP door/barrier phone. CyberData 011214 Product Page and Pricing. For the purpose of this page, we are going to look at the commend intercom, with an integrated axis ip camera and compare the differences. Commend is a great make of Intercom and similar to CyberData. 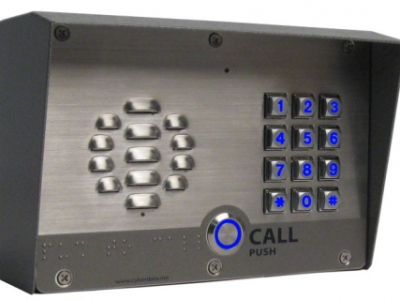 Its a high end product and boast great quality and powerful secure entry features. 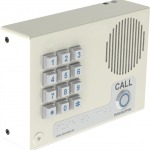 The commend intercom with the integrated Axis ip camera is around £2000 (ex vat). Our Axis SIP intercom bundle removes the integration. When we remove the integration we gain more benefits. We gain greater IP security and IP door entry features for our application. That can’t be a bad thing can it ? If the End User requires Video Door Entry, then security is an issue for them. If security is an issue, why restrict yourself to a camera that is not mounted at the optimum position, for the best field of view. Our reckoning on video door entry phones. If we look back to when the first video door phone was released. We would need to go back quite a few decades. Lets not forget, decades ago CCTV was not as popular as it is now. Let’s say the end user did have an old analogue security camera. The image quality of analogue cameras would not let you know who was at the site or door entry location. This is why a camera pointing right into someone’s face was the best cause of action. No overview camera, years ago, would have identified the visitor. Now we have an abundance of HD IP video cameras made by a forever growing list of IP camera manufacturers. IP video security is also being deployed in more and more business locations. For our Video Door/Site Entry Solution, we use Axis. Axis was the pioneer behind the world’s first IP camera. In 1996 they introduced the neteye 200. You will find “cheaper” ip cameras, mirroring our offering of sip door phones, we like to offer high end and trusted technology. See this Wiki page on the introduction of the first IP camera. So, why not use an overview HD IP camera, this adds multiple advanced features to your installation. The only downside, is the assumption we are adding complexibility to the installation. The fact is, we are not. Cyberdata needs no apps or running software. Just set the outdoor sip intercom up, there is nothing to worry about after the installation. When the intercom makes a call to you, just check your FREE axis monitoring software. We will cover that in a little more details below. Axis Page here on the 16 channel software. If you was to buy, say the Commend Axis SIP Intercom, you would still need software on your mobile or in your office. With the Cyberdata & Axis SIP Intercom bundle, the only software you need is the FREE included Axis Camera Companion. CyberData needs no running software or apps. The SIP intercom simply initiates and makes the call. Better Security: A standard video door phone only shows you a close up of the person at your site. From a security point of view, this is not great. For example, someone could be hid around the corner. One person could be in view of the camera, who or what is 10 feet away, we don’t know. the video camera can be used for 24/7 security. The camera will monitor the entire site entry or door location. ONVIF compliance. Onvif helps with the development of a global standard for the interface of IP-based physical security products. 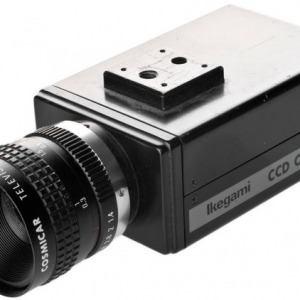 Your HD IP overview camera can merge with other systems. Network Video recorders and Video management software, for example. 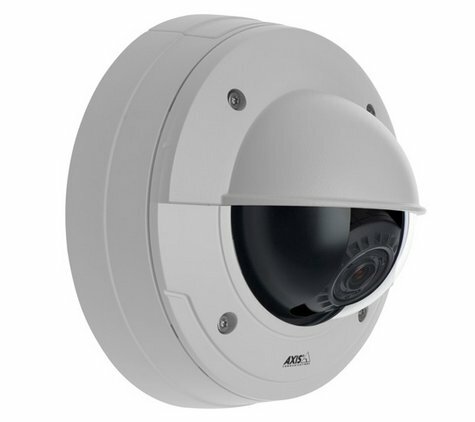 True Day and Night IP Video: The Axis camera used as the overview camera, features an IR cut filter. The camera will detect when its night time. It then changes it recoding mode to monochrome. Edge recording: A standard video door phone is not intended to record the view field. With the Axis overview camera, you can record footage to an SD card, this is called egde recording. Free recording software. If you bought any video door entry phone, you would need to download some kind of software. With the Axis SIP Intercom bundle, you just use the free axis recording software. SIP Intercom calls an IP Phone. Cyberdata is designed more for enterprise use, so this will be the main application. If the intercom called an office or reception area, why not have a monitor or even a small tablet constantly streaming the site entry point. Take the call on your IP Phone, glance at the monitor, if you want to grant access, key in the pre set relay code. SIP Intercom calls a mobile. Axis Camera Companion (the free software) is available as a app on your smartphone. View the camera through your app. Then if you want to grant access, key in the pre-programmed relay code. Call the SIP Intercom before it calls you ?